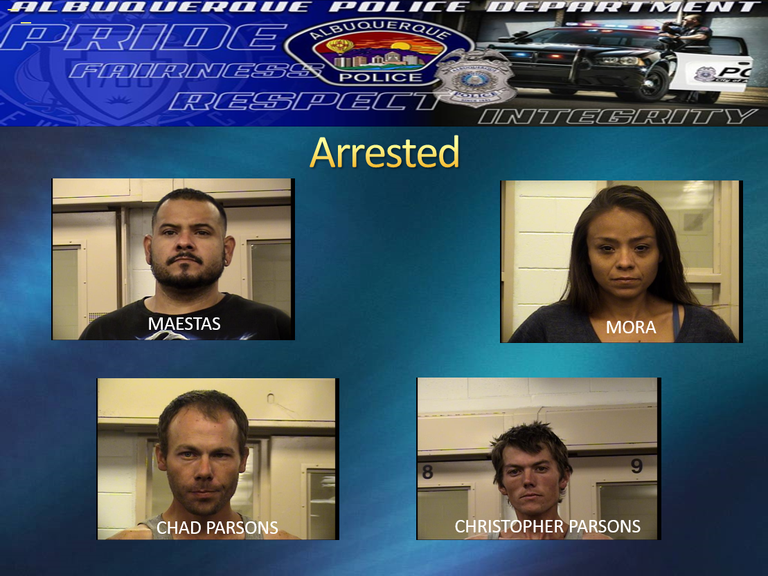 Mario Maestas, 38, Judy Mora, 38, Christopher Parsons, 26, and Chad Parsons, 32 were all arrested in connection to a rash of Auto Burglaries and Identity Theft after detectives secured arrest warrants for them. Beginning in mid April 2017, the Albuquerque Police Department began receiving calls in the Foothills Area Command of a string of auto burglaries that were occurring in various neighborhoods. The Foothills Area Command Detectives took over the investigation and started making contact with several of the victims in these neighborhoods. During their investigation the detectives were able to identify four individuals who were directly involved in these crimes as Mario Maestas, Judy Mora, Christopher Parsons and Chad Parsons.